Perhaps it is in my blood. I don’t really know. My father was the youngest of seven children born in Monroe County, Kentucky. For some reason, he decided to join the US Navy and see the world. So, he up and wandered off, and ended up marrying a Southern California girl (my mother, obviously). The rest, as these arbitrary personalities called they say, is history. I was their first born. I would have to look it up, but I believe I went to eleven schools and had twelve different mailing addresses by the time I was a 13-year-old eighth grader. And I haven’t stopped loving to travel or explore since. If you have read previous blogs, you know I don’t meet a stranger. Exploring different places opens up new worlds and exciting stories to me. Travel used to not be as common as it is now. In my younger years, it was not unheard of for someone to have lived his or her entire life in one state and only visited one or two others. That is not me. I have been to 45 of the 50 states and have visited nine countries outside the US of A—and have only been almost arrested in one foreign land. I have a goal to visit all 50 states. Right now I have drawn up plans to go to Oregon and Vermont this year, and that will leave Hawaii, Montana, and Nevada remaining. My wife and I want to go to Hawaii next year. Later in my life, I set a goal of climbing the high points in all 50 states. So far I only have five: South Dakota, Oklahoma, Arkansas, Missouri, and Texas. But I have another plan drawn up that will take me to nine states and eight high points over seven days. Which do I do first? Back to the time I almost got arrested. During the summer between my junior and senior years in high school, I went to Mexico with the Spanish class. We went to Teotihuacan one of those days. A beautiful and historical treasure. 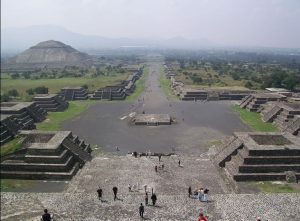 There are two huge pyramids: the Pyramid of the Sun and the Pyramid of the Moon. A storm was moving in, and we only had time to climb the latter. I ran up to the top and took some incredible pictures—that are unfortunately packed away somewhere—of the approaching deluge. Me being the young imp that I was, I decided to come down the side of the pyramid rather than the way you were supposed to. About that time, the sky opened up and dumped a bucket of water onto us. We ran into one of the building on the side of the plaza and watched as the courtyard filled with water. It began swirling around and around like a great whirlpool and drained out a hole in the middle of the floor. During the bus ride back, the vehicle pushed its way through a river in the small town. But we made it okay. This was one of many adventures I have experienced. I love them all. I did get a haranguing during the ride back to Ciudad de México from my teacher. It was worth it. This is the view I had before climbing down on the right side of the picture. I can see you being a rebel. Dangerous place to get arrested. We might never have met and that makes me sad to think about. My mouth both gets me into trouble as well as out.